Oh the dreamy, beautiful, romantic little town known as Venice or Venise, or Venezia, or Venetia. If I could stay for months, I would. Such an absolutely lovely, unique and charming little city on water. I’m falling in love with it all over again as I type these words. I recently had the chance to spend two perfect nights there. Besides all of the fabulous art, churches and shops, I of course also had the chance to get some good eats as well. The first rainy night in Venice, my travel companion and I found a quaint little hidden gem in the dark streets of Venice. As many restaurants in Western Europe offer, we went for the prix-fixe full course option. Here are some things that were worth mentioning in our travel bites. I am still kicking myself for not documenting the most amazing clams I’ve had in a really long time. They were long rectangular-shaped crustaceans of heavenly goodness! Probably the best part of all the courses. I guess I was too busy enjoying them to bother taking any pics. 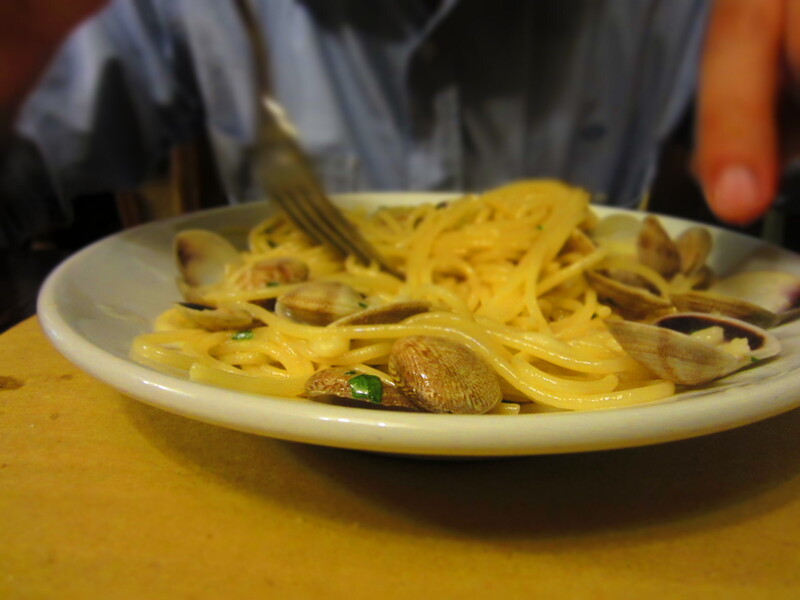 But, the homemade pasta with yet more clams? Subtle, but scrumptious. 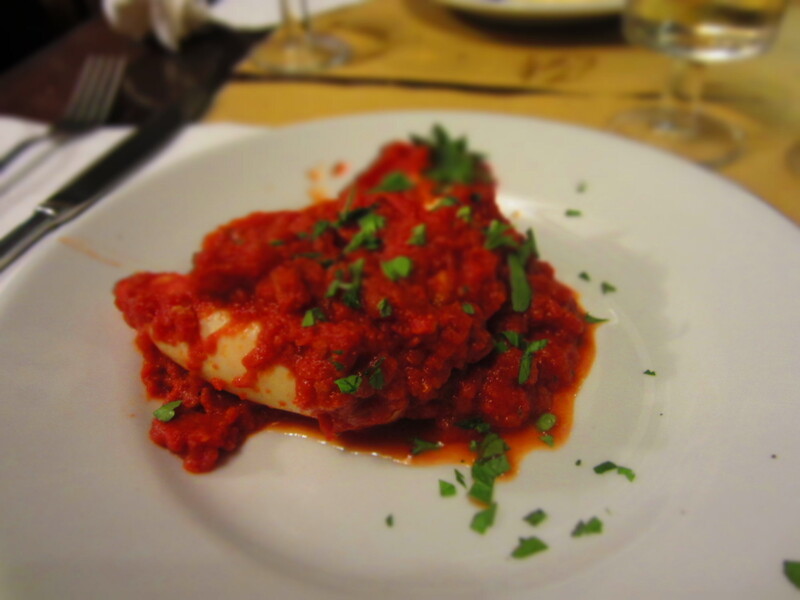 The beautifully crafted stuffed calamari was also damn delish. The stuffing was quite flavorful, consisting of sausage and seafood and very rich and sweet red sauce. I had heard of their unusual specialty dish before getting there, and decided I had to try this intimidating local trademark. Squid in Ink Sauce is a popular local dish and it’s also pretty damn good. Not the prettiest thing to look at, since it is literally black, like, um…ink. We decided to make it friendlier though. 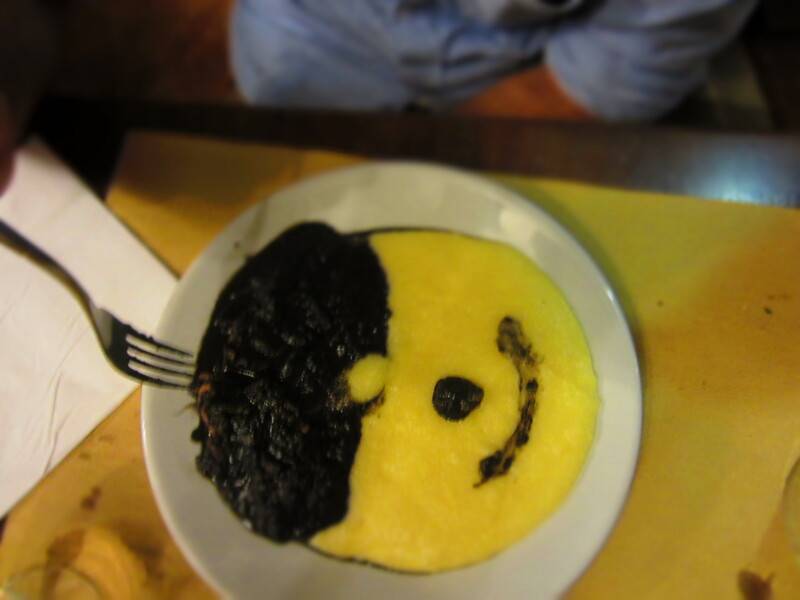 Check out this cute and happy polenta dude with squid ink hair. I’m not usually a fan of polenta, but this combo was doing it right! Day 2, our only full day in Venice, we killed it with an early dinner. Here’s the scene: early afternoon, sun is up, outside seating on a quiet street by the water with taxis and gondolas casually riding by, cool breeze on my face, with a nice glass of red wine making my lips a bit purple. What else could you ask for?? That’s right! More ink! 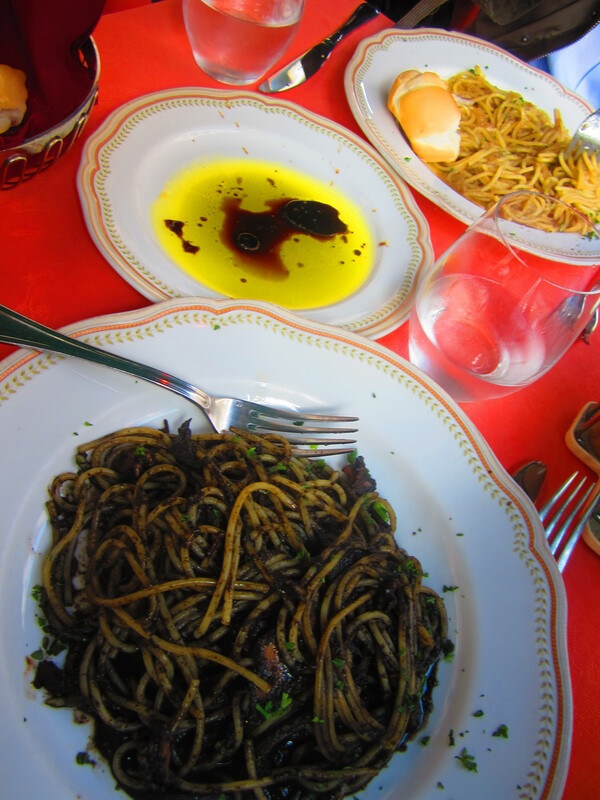 This particular squid ink in pasta was straight up bomb. I can’t wait to go back for this local specialty. Now, if only I could find the notes where I wrote down the names and addresses of these places! My bad. This entry was posted on Tuesday, January 10th, 2012 at 10:00 am	and posted in Travel Bites. You can follow any responses to this entry through the RSS 2.0 feed.